Join us and experience a Jeep Tour in Wadi Rum Desert! Our jeep tours allow you to visit the most sites in the least amount of time as well as reaching some of the far-away attractions of Wadi Rum and beyond Even on our shorter tours, you will visit scenic canyons, soaring jabaal, rock arches, sand dunes and Nabatean sites and you will see nice views. Our longer tours take you to some of the least-visited spots in Wadi Rum while giving you a deeper, more memorable experience in the desert that includes visiting traditional Bedouin families who have kept the nomadic lifestyle passed down for thousands of years. Although we have planned our tours with great care, we welcome your input and are always happy to discuss custom routes. To begin your jeep tour, we’ll pick you up upon your arrival at the Visitor’s Center and take you to our house in Wadi Rum village, where we’ll discuss your route over tea and, time permitting, visit the nearby Shalalla Spring and the 2,000-year-old Nabatean Temple, a one-hour round-trip walk from our house. All tours besides our the two, four and five-hour tours include cooked meals, while ALL tours include plenty of water, tea, English-speaking guides, jeep and sleeping equipment in our camp for overnight trips. Our camp is equipped with large private tents, a modern bathroom with Wester-style toilets and water. BRING: Torch, camera, warm clothing in winter, sleeping bag (optional), sunscreen and a good hat. Outside of summer months, lunch stops typically last about 1 1/2 hours, but during the long days of summer months, our lunch hours are extended with a short siesta, the combination lasting a maximum of 2 1/2 hours. Since summer months receive more daylight hours, we are still able to visit the all the attractions listed in your tour. On tours lasting more than one night, visitors can choose to spend one night in the open desert in addition to the night spent in our camp. If you only have a very short time in Wadi Rum, we can help you make the most of your visit to some of the best nearby attractions. These will include Lawrence’s Spring, Khazali Canyon, the sand dunes and the Nabatean Map inscription. The tours can include climbing the dunes and short walks at all the sights. *Spending a night in the camp includes 2 hours tour with an overnight stay in our desert campsite. Includes dinner and breakfast (Price: 1pax 65JD, 2-3pax 45JD, 4-6pax 40JD, 7+ 30JD). In our four-hour tour we can show you much more than in the two-hour two. This tour will also include a desert tea break during which we can build a fire. 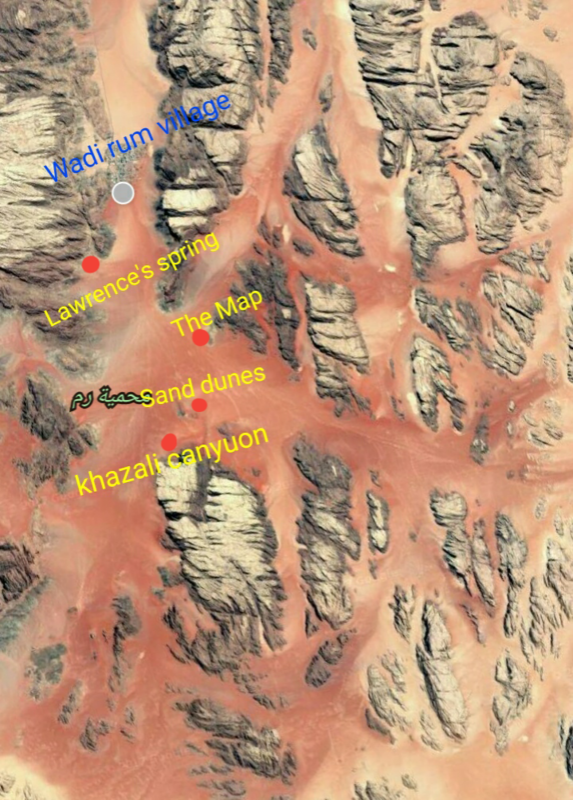 Some of the sites we will reach are Lawrence’s Spring, Khazali Canyon, the sand dunes, the Anfishiyeh inscriptions, Lawrence’s House, Small Arch, and Umm Fruth Rock Bridge, as well as a pass through Geber Amra Canyon. All of the sights can be explored by foot, from climbing the dunes to the top of rock bridges. *This tour include a light lunch. *One night in the camp includes 4 hours tour with an overnight stay in our desert campsite. Includes dinner and breakfast (Price: 1pax 70JD, 2-3pax 50JD, 4-6pax 45JD, 7+ 35JD). Our five-hour tour is an extension of the 4-hour tour which includes a trip to the base of Burdah Rock Bridge, the largest natural arch in Wadi Rum. This tour involves journeying further into the vast desert with the opportunity to view wilder scenery than before. It also features the chance to hike through Khashaba Canyon, a brief but beautiful walk through a red and white shaded gorge. This is in addition to climbing the dunes, reaching the top of rock bridges and exploring other sites by foot. *This tour include Light lunch. If you only have one day in Wadi Rum, this tour will ensure that you maximize your time, taking you deep into the park. Highlights include Lawrence’s Spring, Khazali Canyon, sand dunes, Anfishiyeh Inscriptions, Lawrence’s House, the Mushroom Stone, then stop to have a lunch in the middle of the Desert, after that continue the tour to see Burdah Rock Bridge, Umm Fruth Arch, a 40min walk through Abu Khashaba Canyon and an hour walk through the stunning Barra Canyon, one of our absolute favorite spots. To end our tour, we’ll catch the sunset in a picturesque spot and return to Wadi Rum village in the early evening. *Lunch is included in this tour. If you have a full day and a night in Wadi Rum, this tour packs the most sightseeing and exploring into your time. After following the same route as the one-day tour, and enjoy the sunset view you’ll head from there to our Bedouin campsite beneath Jebel Araqqa. There you’ll have time to relax and explore the area on foot before a hearty Bedouin meal in our long, goat-hair Bedouin tent and enjoy the evening. You’ll be able to sleep in private tents, in the large tent or under the stars. All sleeping gear is provided. Following breakfast the next morning, you’ll return to Rum Village by jeep (20min) OR mounted on a ship of the desert (2hrs; 25JD extra per camel). With two days in Wadi Rum, you’ll have plenty of time to visit the most spectacular sites as well as do a good share of exploring the narrow canyons on foot. We will visit Lawrence’s Spring, the Nabatean Map, the sand dunes, Anfishiyeh Inscriptions, Umm Ishrin Canyon, a hike through Barra Canyon and the Mushroom Stone before retiring to our Jebel Araqqa Bedouin camp, where you’ll have time to relax and explore the area on foot. After a hearty Bedouin meal in our goat-hair Bedouin tent and enjoy the evening. You’ll be able to sleep in private tents, in the large tent or under the stars. All sleeping gear is provided. Following breakfast the next morning, you’ll visit Burdah Rock Bridge, hike through Burdah Canyon, Karuba View, a scramble to the top of Umm Fruth Arch, a 40min walk through Abu Khashaba Canyon, a 1/2hr walk through the broad Geber Amra Canyon, as well as visits to the Small Arch and Khazali Canyon before returning to Rum Village. 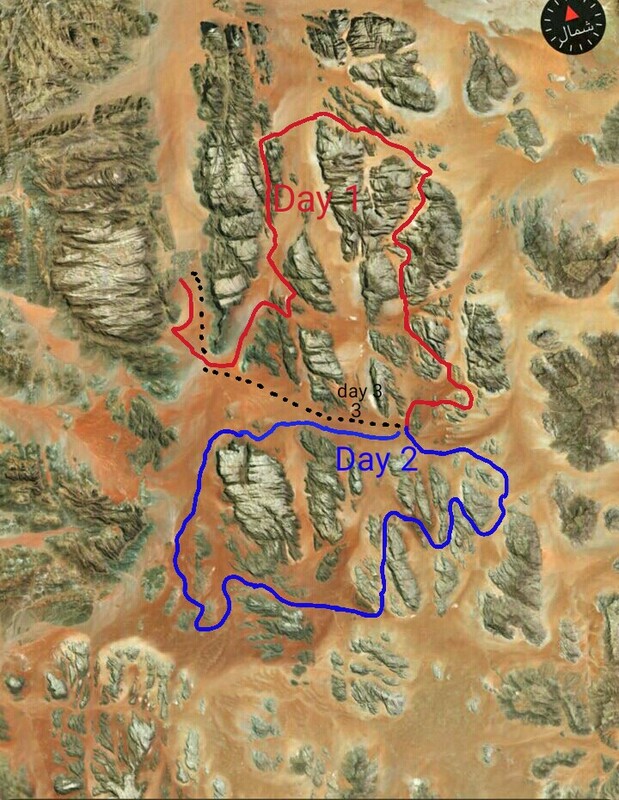 This route is almost identical to the 2-day/1-night tour, but gives you a second night in the desert. You may choose to spend your second night in the open desert (depending on the Weather and the Availability) or in our camp . Following breakfast on the third morning, you will return to Wadi Rum Village by jeep (20min) OR mounted on a ship of the desert (2hrs; 25JD extra per camel). With three days in Wadi Rum you’ll have the chance to go deeper into the desert and see much more of its hidden attractions in addition to all the places listed in the shorter tours. 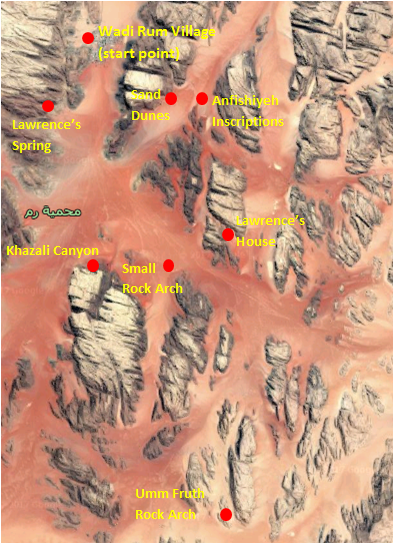 These sights include Lawrence’s Spring, the Nabatean map, sand dunes, Anfishiyeh inscriptions, Umm Ishrin canyon, small rock arch, Khazali Canyon, Burdah rock arch, Umm Fruth and the mushroom stone. Additional places that you can visit include the Bedouin cisterns far to the south, Al-Qatar Spring and the picturesque Umm al-Samn Arches. You also have the choice to add some camel-riding or a longer hike, such as the climbs to Burdah or Umm Adami to your tour at additional cost. This tour is sure to get your clothes a bit dusty, but don’t worry: you’ll have access to a water shower in our camp, and you may also use our shower in the village when you return on the final evening. On this tour you can spend two nights in the wild in different settings. In addition to the night spent in our camp. Even more than on the 3-day tour, you’ll have the freedom to add good amounts of time on camels, hiking and climbing to Burdah and/or Umm Adami. For example, you can take two full days to explore by jeep, combined with the 3hr climb to Burdah Rock Bridge. Spend a third day in the far south including the 3-4hr climb of Umm Adami. And spend a fourth day experiencing some of Wadi Rum’s remote narrow canyons by camel. We can also take you to the east of Wadi Rum to visit vast dunes and the rarely-visited ancient Nabatean inscriptions of Al-Hudhn. Whatever it is you’re after, we will make the most of your four days in Wadi Rum. This tour allows you discover more of Wadi Rum than any of our other tours. As outlines in the 4-day tour, our 5-day tour is highly customizable according to your tastes and desires. In addition to visiting almost all of our favorite spots in Wadi Rum, including remote sites like Wadi Sabet, Umm Adami, Al-Hudhn, Nughara Canyon and several secret, yet-unnamed places, you’ll have four nights in the desert, three of which may be spent in the wild (if the weather permits). We’ll also share tea with some of our truly Bedouin relatives living in the desert. You may also choose to spend large chunks of your time hiking to the summit of Umm Adami. 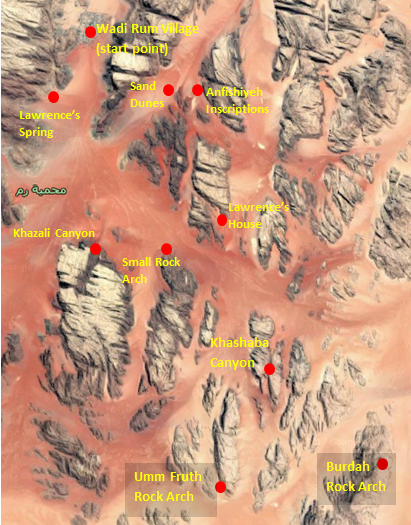 Jordan’s highest point, and Burdah Rock Bridge, or traveling like the Bedouin, mounted on camels. 2019 © Wild Wadi Rum, Wadi Rum, Jordan. All Rights Reserved.